After a very full-power year of joys and challenges, saying goodbye to 2018 felt very strong for me. I felt exhausted, out of inspiration and in need of a retreat for the space and time to reconnect with myself and how I want to manage the many beautiful responsibilities of my life as Larah, a woman who LOVES music, horses, yoga, dancing, laughing, singing, cycling, travelling, sharing LIFE with dear sisters, friends and family. Because I had been trying to do it all, and had not been having enough “Larah time” to just be myself, I was completely out of balance by the end of the year. 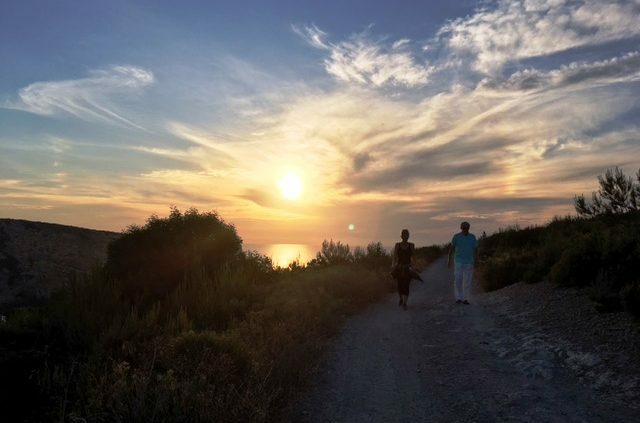 I was giving too much to my work – BECAUSE I love our incredible organization of Ibiza Retreats (in fact, Ibiza Retreats was my FIRST baby!) it was too easy to become totally immersed, which meant other areas of my life were neglected. Caring for my business feels GOOD because we serve a good purpose in supporting many of you to heal, grow and transform! Yet this was also causing me to feel guilty, frustrated and like I was not enjoying enough what I SHOULD be celebrating every day: my amazing, loving family and friends. So I got on a plane on December 28th with my two year old daughter and went to meet a dear sister and soul-mate with whom we could retreat together, walk, talk, laugh, cry, download our “burnings” and share our learnings from 2018, to begin 2019 centered, clear and connected to our new visions, heart-felt wishes and dreams. And what I received, whilst retreating myself, was time and space for my head to unpack the spiders webs of thoughts and self-analysis. It gave me fresh natural views of mountains and trees that fields, sheep and blue skies that were NEW to my eyes, free of memories, thus offering new HEAD space for contemplation and self-reflection. With this head space I could listen in more clearly to my body’s intelligence, reconnect deeply with my TRUE physical needs and actual energy levels, & recognising what was depleting me practically and emotionally. I came away with clarity, peace and, after sharing tears, joys, life stories and laughter – I returned to my family, home and daily life REFRESHED, with clarity about how I want to LIVE this new year, at work, at home and at play. I feel stronger, lighter and FREER and able to let go – yep DROP what no longer serves me. I have got a true sense of higher perspective again and my HEART is singing and happy! As we are all now into this new year, it offers a new opening…. a portal to infinite new possibilities. It is a blank slate, energetically and physically, onto which you can write a new story and become again the conscious creator of your life the way you REALLY wish it to be.And the wonderful thing to remember about this, is that this new blank slate is offered to us EVERY SINGLE DAY! In this first flush of the New Year enthusiasm, JANUS, the January God of two heads, invites us to look back without regret over the last year and then focus forward to the future. A wonderfully simple strategy is to make a burn list and a learn list. It is a simple way to accept, forgive and release what no longer serves you – and get your heart, mind and energy field focused in YOUR right direction for a magical year ahead. You can lovingly and non-judgmentally look at each behavior/habit/or stress-causing pattern that you want to leave behind or “burn” and instead consider what you are “learning” to do, think or be differently instead. This will clarify your new life choices and help focus your intentions for the year ahead. A good way of looking at what you are “burning” is writing down everything you are aware of that creates stress in your life. And yes… you may note that a LOT of the stressful situations arise from blurred lines between WORKING LIFE and HOME/FAMILY/SOCIAL/PRIVATE life which can create a state of serious overwhelm. 2. Work Whatsapps / emails interfering with being able to happily “manage” family/social life? / Create a phone altar to check in at designated times of day AND purchase a separate personal phone and choose when you feel most calm and clear to read/respond to emails. 3. Reaching for the chocolate every evening after supper? / Only purchase chocolate on weekends and buy choco chilli tea instead! Depending on others for positive feedback / Appreciating all that I do, give and am and checking that I am not “doing to much” when I am demanding appreciation from others. Saying “Yes” to requests because it feels good to make others happy / Checking in with myself “does this feel like a pleasure or a pressure? Do I have enough time and space to commit to this right now? Looking at what my husband doesn’t do around the house / Using the power of appreciation to show my gratitude for everything he DOES to keep us warm, support the family – keep the laundry cycles flowing! Feeling guilty when I shout at or react to my children (rather than being the conscious mother I aspire to be!) / Writing up my lunar cycle – so that I can track the Spring, Summer (ovulation), Autumn, Winter (bleed) times and be gentle with myself on the more sensitive days, advise my family and diminish activities and responsibilities on those days! Once you have your own selections of ‘burnings’ either outdoors, or carefully over a candle flame, release the burnings with gratitude (because EVERY thought, word and deed has got you to where you are NOW – today!) as much as you can…. And, with this purification process complete, and your inner-space cleaner and clearer, find a quiet space where you won’t be disturbed to listen to this MANIFEST YOUR HEARTS DESIRE GUIDED VISUALISATION. This will prepare you perfectly for creating a dream/vision board for which you just need magazines, newspapers and shiny things and this link will take you to a Guided Visualisation in how to make a Vision Board to align with your intentions, wishes and needs.